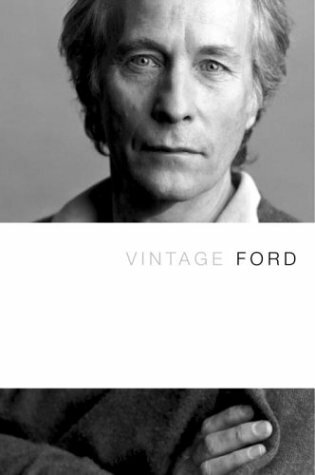 I just finished reading Vintage Ford, a selection of Richard Ford’s writings. Richard Ford is most notably known for his Sportswriter Trilogy: The Sportswriter, Independence Day, The Lay of the Land. This collection has selections from Independence Day, a few short stories, as well as a short novella “The Womanizer” which is probably the highlight of this selection. The best way for me to describe Richard Ford is by placing him alongside other prominent American writers. Ernest Hemingway and F. Scott Fitzgerald are the two writers whose prose his is most similar to and Ford’s subject matter is just as varied, from duck hunting in New Orleans to torrid love affairs in France. His style is plain and easy, very straightforward and he captures the colloquialisms of the Northeast and the South especially well. One subject that seems to continually come up throughout the selections given concern the relationships between sons and fathers, though I am unsure if this is simply because of the choice of selections in this edition or if this is more representative of his works in general. There are a number of books in this particular Vintage series: V.S. Naipaul, Vladimir Nabokov, Richard Ford, Sandra Cisneros, Kingsly Amis. I picked up a few myself and I urge you, my fellow blog reader to do so as well. A rather inexpensive way to introduce yourself to an author’s work with an affordable paperback that has various selections from an authors career. Look for my reviews of Cisneros and Nabokov to follow. Cheers. I was just reading a short story from my Vintage Ford, collection of short stories and excerpts from Richard Ford and there was a word that he used that was not part of my vocabulary. Maybe some of you have heard of the following word, but I have not. Yat refers to a unique collection of dialects of English spoken in New Orleans, Louisiana. The term also refers to those people who speak with a Yat accent. The name comes from the common use amongst said people of the greeting, “Where y’at?” (Where you at? ), which is a way of asking, “How are you?” The Yat dialect sounds similar to that of Brooklyn, New York, natives, with influences from Louisiana Creole French and Southern American English, particularly Older Southern American English. While the term Yat is usually reserved specifically for the strongest varieties of the New Orleans dialect within the city, the term often refers specifically to speakers of Yat, outside of the city proper, and around the rest of Louisiana. Well there you go, some random information for everyone to enjoy. Incidentallyt, the context of my coming across this word is in a short story by Richard Ford, titled “Calling”, in which a young man goes duck hunting in the New Orleans bayou with his father and along with them is a servant whom they refer to as a “yat”.